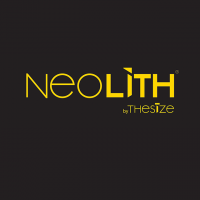 The Neolith brand was launched by TheSize in 2011 as a high-end compact surface with revolutionary physical and technical features. Neolith combines the best raw materials with state-of-the-art technology to create high-tech slabs for interior and exterior design. Neolith is an ideal material for renovation projects, since it can be applied directly to already existing surfaces, providing cost and handling time benefits. Neolith slabs are also available in custom sizes for bespoke projects. Neolith offers the largest existing sintered compact surface slab on the market. The availability of two large formats, measuring 3,200mm x 1,500mm and 3,600mm x 1,200mm, allows for greater uniformity, continuity, easier handling, and a minimal number of joints for aesthetic and hygiene benefits. Available in industry standard formats, Neolith is also lightweight, with a 3mm board weighing 7kg/m², and a 12mm option at 30kg/m². Neolith’s range of thicknesses accommodates a variety of different purposes. For furniture and interior wall cladding, using 3mm is recommended, while 6mm can be used for interior and exterior flooring, and exterior tiling purposes, such as ventilated façades. 12mm is reserved for more demanding projects such as kitchen worktops.